From Y: The Last Man to the current Eisner-darling, Saga, Brian K. Vaughan has proven time and again that he is one of the most talented storytellers in the medium. So when it was announced at Image Expo 2015 that he would be launching a new series with artist Cliff Chiang, the artist behind the critically-acclaimed New 52 Wonder Woman series, comic fans everywhere jumped to add the book to their pull list. 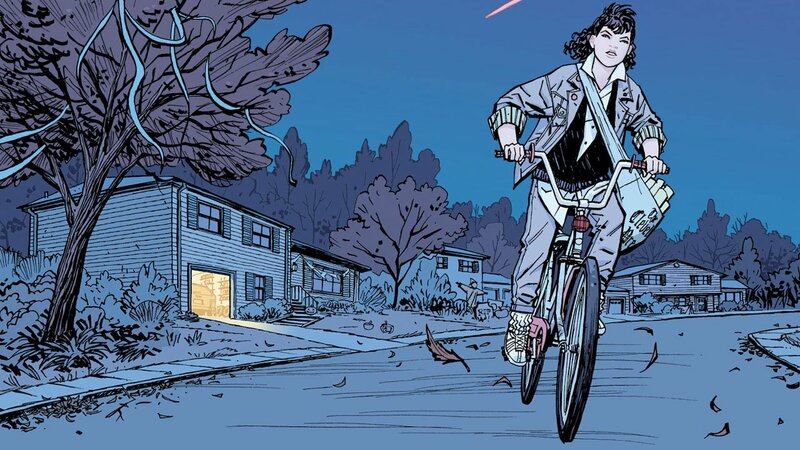 That book was Paper Girls, a coming-of-age tale set in 1988 Cleveland at the onset of an alien invasion. It’s a unique combination, one that Vaughan and Chiang deliver on almost flawlessly. Paper Girls is the story of Erin, a twelve-year-old newspaper delivery girl fascinated by outer space. She wakes up before dawn on November 1st, All Saints’ Day, a notoriously tough day for delivering the news. The morning of November 1st is populated by the remnants of Halloween’s mischief makers. It’s not long into her route before Erin is harassed by a group of teenagers trying to steal one of her papers. Enter MacKenzie, Tiffany, and KJ, a gang of fellow delivery girls, who chase off the teens. The four quickly form a group for mutual protection before heading off into the early morning. Vaughan wastes no space, devoting every panel to characterizing the four leads. Only a few panels after they’re introduced, the characters are easily identified by their personality types and respective roles in the group. Chiang’s art does a lot of the heavy lifting, featuring detailed expressions and postures that help define the characters. It’s these little details—MacKenzie’s nonchalant slouch, KJ’s tense shoulders—that make each character stand out. MacKenzie, the de facto leader of the group, tells them to split into pairs to cover more ground. Erin joins her and the two play off of each other brilliantly, each a stark contrast to the other. It’s here we learn that MacKenzie was the first girl to deliver newspapers in their town, leading Erin to idolize the rebellious teen. Unfortunately, we also learn a little bit about MacKenzie’s family and their criminal tendencies. Before it can be explored, however, a new problem arises. The other pair has been attacked by strange men dressed in black. After trying to track them down and inadvertently discovering a possible alien space craft, it becomes clear that the things in black are not of this world. By the end of the book, one thing is certain: Vaughan is an absolute master of the form. The issue is perfectly plotted, matching all of the big reveals to the turn of the page. The book runs for forty pages and the team makes great use of each one. The plot does slow down a little in the middle of the book, but it’s more than made up for by the end. Paper Girls #1 did what a good first issue should do, and laid out all of the pieces for a great story. Now all that’s left is to put them together. Chiang’s art is largely responsible for keeping the slower moments of the script exciting, gifting every panel with rich details. From the characters’ clothing to the posters in Erin’s room, everything has a purpose and helps to inform the narrative. It helps that the art is gorgeous, shifting from realistic when focused in on the characters to dreamlike surrealism in the book’s moments of fantasy. 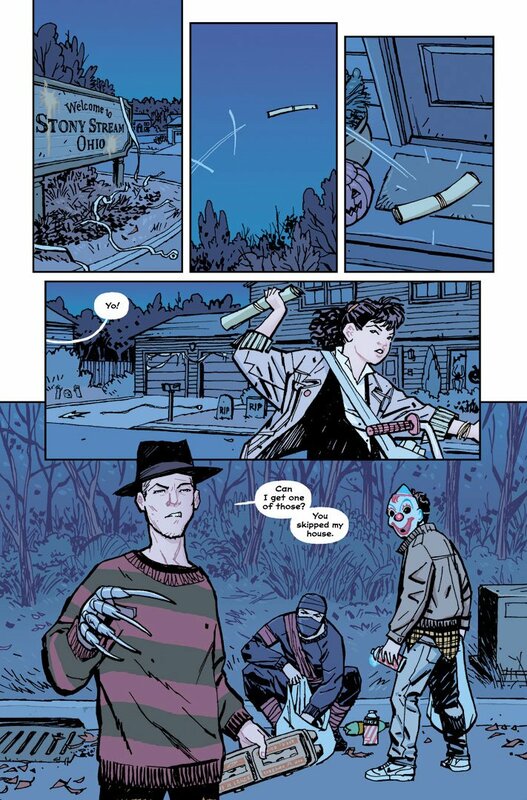 Colourist Matt Wilson does an excellent job here, shrouding most of the Cleveland suburb in muted darkness. However, during a dream sequence, his colours explode with vivid intensity that will stay with the reader throughout the book. 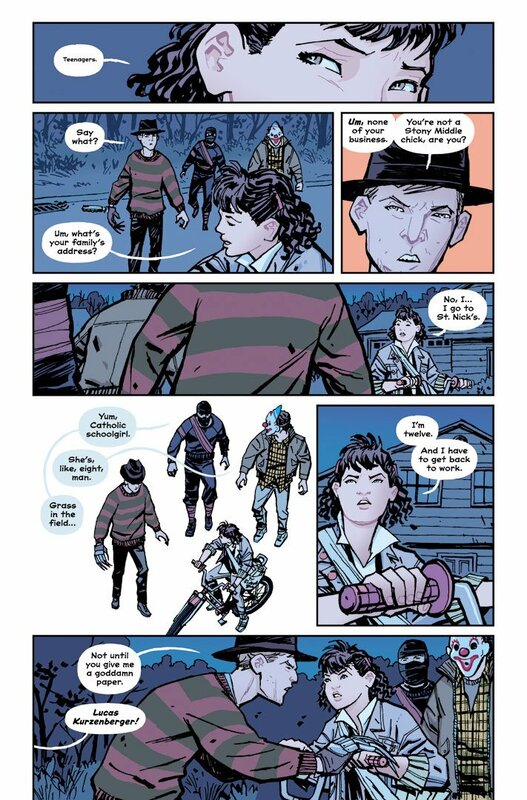 Vaughan and Chiang have a hit with Paper Girls. Stunning artwork combined with fantastic plotting and dialogue make this debut easily one of the best of the year. The series has already been confirmed to have a definite ending; however, if it remains this good, let’s hope it never gets there. Paper Girls is the story of Erin, a twelve-year-old newspaper delivery girl fascinated by outer space.